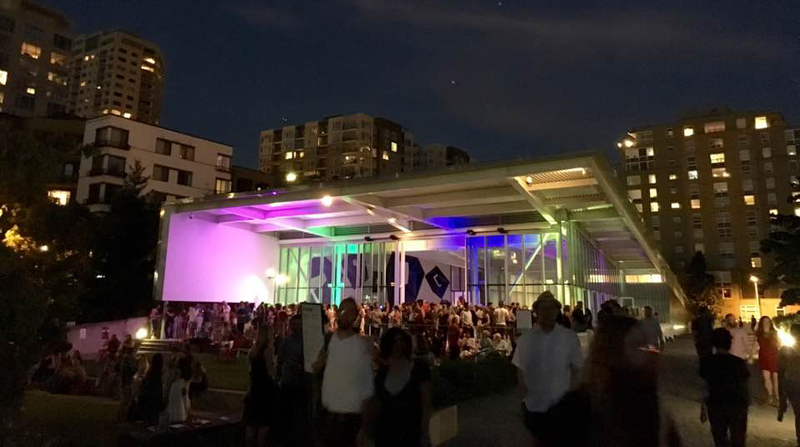 Last night was the SAM Remix party at the Olympic Sculpture park, and thanks to Allison Kudla, I was invited to give a “my favorite things” (MFT) tour of some of the sculptures. 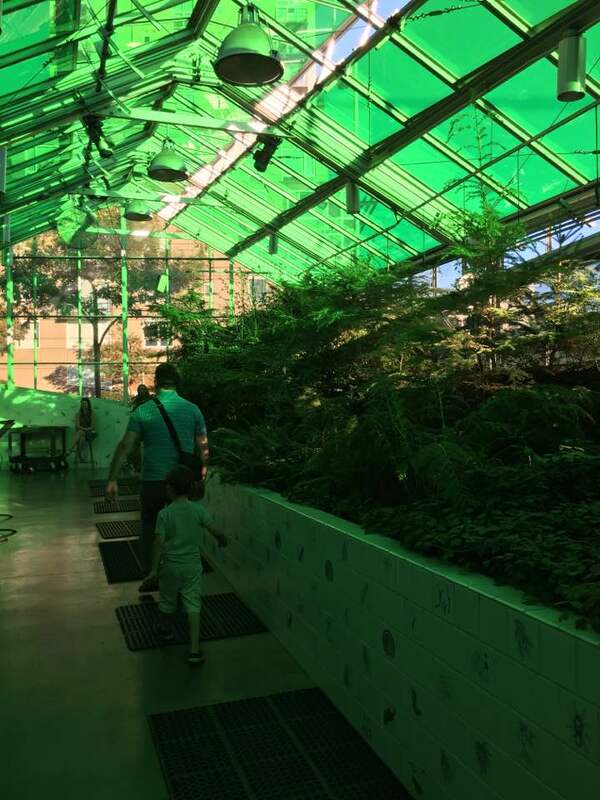 I chose to compare and contrast Tamiko Thiel’s “Gardens of the Anthropocene” augmented reality installation with Mark Dion’s “Neukom Vivarium.” To me they are inverses of each other–turned inside out and backwards, yet centered on similar themes. Gardens of the Anthropocene places digital flora, mutated from real species found near the park environs, into the real world, which you can experience by looking through your phone or ipad screen as you walk the paths. 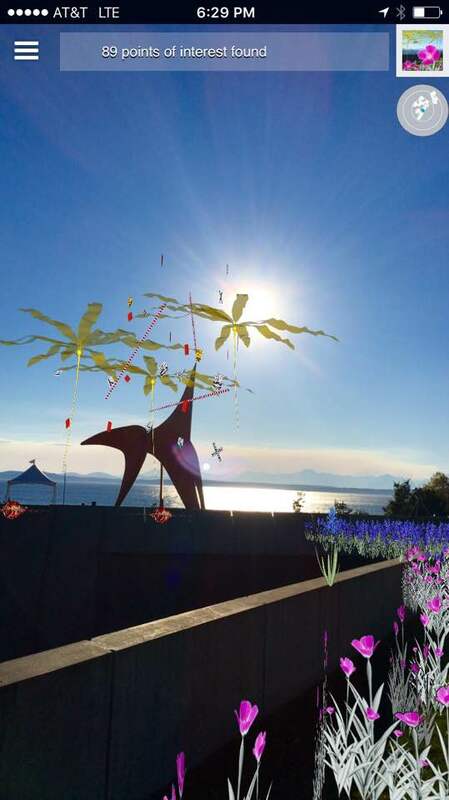 These new plants have evolved to thrive on the effluence of human activity (cell phone electromagnetic radiation, warmer sea water) conjuring a beautiful yet foreboding future. The overlaid digital fantasia is constrained by your screen, and as we walked, some participants made observations about uneven access to this work—only those with AR-capable phones and Internet access can experience it. And even with that, it did take a bit of work to view: you first need to point your phone camera at a QR code on a physical kiosk. But as the sun went down, our phone cameras had trouble seeing the QR code, and we took turns using phone flashlights to illuminate the sign so phones could load the app. It felt a bit fragile—something true of most AR experiences at this time. In “Gardens of the Anthropocene” technology is hosted by nature, and in the Vivarium, it’s nature hosted by technology. Both reflect on humankind’s impact on the planet. And each artwork exists in spaces created by a tenuous fusion of nature and engineering. Here’s an insightful interview with Mark Dion about his thinking behind the Vivarium.